Americas gateway to the universe. Leading the world in preparing and launching missions to Earth and beyond. 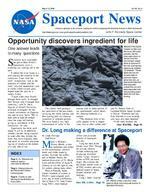 March 12, 2004John F. Kennedy Space Center Spaceport Newshttp://www-pao.ksc.nasa.gov/kscpao/snews/snewstoc.htm Vol. 43, No. 6(See WATER, Page 6) INDEX Page 8 Tickets on sale Monday for the All American Picnic 2004 Page 3 Dr. Williams fire research sparks international attention Page 5 New procedures test Reinforced Carbon Carbon panels AMONG THE SIGNS of water on Mars are the round, BB-sized particles, like the ones seen here in a mosaic from the microscopic imager taken at a portion of the rock outcrop near Opportunity, dubbed "Guadalupe." These spherules are not concentrated at particular layers within the rock, as they would likely be if they originated outside the rock and were deposited onto accumulating layers while the rock was forming.One answer leads to many questionsScientists have concluded the part of Mars NASAs Opportunity rover is exploring was soaking wet in the past. Evidence the rover found in a rock outcrop led scientists to the conclusion. Clues from the rocks composition, such as the presence of sulfates and the rocks physical appearance, such as niches where crystals grew, helped make the case for a watery history. Liquid water once flowed through these rocks. It changed their texture, and it changed their chemistry, said Dr. Steve Squyres of Cornell University, principal investigator for the science instruments on Opportunity and its twin, Spirit. Weve been able to read the telltale clues the water left behind, giving us confidence in that conclusion, he said. Opportunity has more work ahead. It will try to determine whether, besides being exposed to water after they formed, the rocks may have originally been laid down by minerals precipitating out of solution at the bottom of a salty lake or sea.Opportunity discovers ingredient for lifeThe robotic field geologist has spent most of the past weeks surveying the whole outcrop, and then turning back for close-up inspection of selected portions. The rover found a very high concentration of sulfur in the outcrop with its alpha particle Xray spectrometer, which identifies chemical elements in a sample. The chemical form of this sulfur appears to be in magnesium, iron or other sulfate salts, said Dr. Benton Clark of Lockheed Martin Space Systems in Denver. Elements that can form chloride or even bromide salts have also been detected. At the same location, theDr. Long making a difference at SpaceportMarch is Womens History Month, a time to remember and reflect on the contributions, achievements and strides made by women. Consider the selfless acts of Mother Teresa, the medical discoveries of Dr. Marie Curie and the efforts of Susan B. Anthony to win the right to vote for women, among many others. Here at Kennedy Space Center, hundreds of women in NASAs space program work every day to make a difference. One of them is Dr. Irene Duhart Long, KSCs chief medical By Linda Herridge Staff Writer officer and associate director of Spaceport Services. Long has been at the Center since 1982. Though her private interests include collecting and displaying miniature scenes, Longs responsibilities at KSC are much larger. She oversees the day-to-day health issues of all KSC workers and every medical aspect of Space Shuttle launches and landings. Longs father inspired (See DR. LONG, Page 5)DR. IRENE LONG is the KSC chief medical officer and associate director of Spaceport Services. SPACEPORT NEWS Page 3 March 12, 2004Recognizing Our PeopleIn an environment surrounded by combustible materials, flame-resistant tools are safety essentials. An expertise in these high-performance materials led to recent publication in highly-regarded technical journals for Dr. Martha Williams, one of the Centers leading polymer research chemists. Having my work recognized is very rewarding, Williams said. This recognition also provides a forum for showcasing NASAs technology and KSCs research capabilities. Selected as the NASA Hugh Dryden Memorial Fellowship recipient in 1999, Williams research helped the Centers needs and Strategic Plan. Intrigued by her knowledge, NASAs Langley Research Center collaborated with Williams to develop high-performance polyimide foams. Through this cost-saving research partnership, the team developed a low-density, flameresistant foam that provides thermal and acoustic insulation, and high-performance structural support. It also meets NASAs needs for reusable insulation foam on the thermal protection systems of future space vehicles. Research and publications are part of my responsibilities asDr. Williams' fire research sparks international attentiona research scientist, she said. We are responsible for developing and evaluating specialty polymeric or composite materials to meet advanced spaceport technology needs. After completing a standard peer-review submission process, some of this research is now being published in international scientific journals. Polymer Degradation and Stability Journal is including Williams Aromatic Polyimide Foams: Factors that Lead to High Fire Performance story. And Journal of Adhesion Science and Technology is publishing Characterization of Polyimide Foams after Exposure to Extreme Weathering Conditions in a future issue. The publications address the thermal stability and fire performance of the polyimide foams, and how the foams are affected by weathering conditions. The KSC Beach Corrosion Site was used for the weathering studies, she explained. This research led to insight into foam technology and also helped lead to Langleys licensing and commercialization of these foams. While these are Williams publishing highlights, she and her colleagues have produced more than 20 articles in four years, including a chapter in American Chemical Societys Fire and Polymers They are also supporting NASA-Langleys Return to Flight studies concerning external tank foam shredding. We are presently developing other specialty polymers that have applications in cryogenics, electrostatic dissipation, flame retardancy, and possible radiation shielding, she said. This research has great potential for intellectual property for NASA-KSC. Williams, a Testbed Technology Branch employee, explained the research also prompted additional recognition, such as NASAs 2003 Turning Goals into Reality Award.DR. MARTHA WILLIAMS helped develop a low-density, flame-resistant foam that provides thermal and acoustic insulation, and highperformance structural support. It also meets NASA's needs for reusable insulation foam on the thermal protection systems of future space vehicles.By Jennifer Wolfinger Staff WriterLiving life to the fullest may sound like a clich to those who havent witnessed anyone doing so. But those whove met, worked with, and heard legendary stories about Kennedy Space Centers Virginia Whitehead know just how inspiring that mission truly is. Most of us have attended retirement coffees and bid tearful farewells to longtime colleagues who shared an office with us for decades. Like those relation-Early space pioneers knew Whitehead as 'an exception to the rule'ships, Whiteheads time at KSC spans many years. But thats where the similarities end. Beginning her KSC career at 50, shes still planning her future professional path 30 years later. Turning 80 years-young this month, Whitehead is still graciously lending us her astronomy expertise. Law school is her next planned step and she dreams of visiting Mars or the Moon. At age 10, she identified her fondness for astronomy. Her interest in rocketry began while working at Johns Hopkins Applied Physics Lab in Maryland after attending college. Whiteheads duties included interpreting data for Wallops Flight Facility missile launches in Virginia. She then applied her knowledge at a California observatory, in the missile industry again, and eventually at NASAs White Sands Test Facility in New Mexico. All the rules they made at White Sands were based on what I did, she joked. If I did it, they had to make a rule against it. (See WHITEHEAD, Page 8)VIRGINIA WHITEHEAD recently turned 80 years-young. Page 6 SPACEPORT NEWS March 12, 2004By Jennifer Wolfinger Staff WriterWhen you handle as many explosive ordnances as KSCs Doug Younger, your work gets noticed. Younger, an environmental specialist in Spaceport Services, earned a KSC achievement award for properly disposing of dangerous items, including rocket motors and highly flammable parts used during Shuttle launches. He describes the award, received during a ceremony in October at the KSC Visitor Complex, as a blessing. The process goes far beyond just throwing used parts in the trash. According to Younger, certain ordnances are reusable and others must be properly disposed of in accordance with state and federal guidelines. He has handled explosive bolts and linear-shaped charges used on the Solid Rocket Boosters and External Tank during Space Shuttle launches. To deal with these items, Younger and others in his division coordinate efforts with the 45th Space Wing environmental group, the U.S. Air Force Explosive Ordnance Disposal Unit, KSC Shuttle Program, United Space Alliance, and the Air Forces Launch Operations and Support Contractor, Svrdrup, Inc. Younger also coordinates recycling and waste disposal associated with expended ordnance items with Space Gateway Support waste management. Aluminum parts are stored for reclamation at a facility on Ransom Road and eventually transported away from the Center for recycling. There is rarely a dull moment during his work day. Youngers division is currently working on getting rid of pre-Challenger explosives considered excess to the Shuttle Program. He also is working on disposing of rocket motors from NASAs early Global Positioning Satellite Program, and other payload ordnances from the 1970s and 1980s. We try to coordinate with other NASA Centers to see if they want any of the parts, said Younger. The Hawaiian native grew up in Colorado and earned a B.S. in Industrial Technology from the University of Colorado. An avidYounger always ready for a 'volatile situationbiker in his early days, Younger worked to pay for college by rebuilding motorcycles. He has owned 13 motorcycles and six of them were Harley-Davidsons. Youngers varied careers prior to joining NASA in 1994 include working for the mining industry and the Burlington Northern Railroad. He served in the U.S. Navy as a civil servant in industrial hygiene and safety from 1983-87 before joining what then was known as KSCs Shuttle Safety group in 1988.WATER . .(Continued from Page 1)rovers Moessbauer spectrometer, which identifies iron-bearing minerals, detected a hydrated iron sulfate mineral called jarosite. Opportunitys miniature thermal emission spectrometer has also provided evidence for sulfates. On Earth, rocks with as much salt as this Mars rock either have formed in water or, after formation, have been highly altered by long exposures to water. Jarosite may point to the rocks wet history having been in an acidic lake or an acidic hot springs environment. The water evidence from the rocks physical appearance comes in at least three categories: indentations called vugs, spherules and crossbedding, according to Dr. John Grotzinger, sedimentary geologist from the Massachusetts Institute of Technology, Cambridge. Pictures from the rovers panoramic camera and microscopic imager reveal the target rock, dubbed El Capitan, is thoroughly pocked with indentations about a centimeter (0.4 inch) long and onefourth or less that wide, with apparently random orientations. This distinctive texture is familiar to geologists as the sites where crystals of salt minerals form within rocks that sit in briny water. When the crystals later disappear, either by erosion or by dissolving in less-salty water, the voids left behind are called vugs, and in this case they conform to the geometry of possible former evaporite minerals. Round particles the size of BBs are embedded in the outcrop. From shape alone, these spherules might be formed from volcanic eruptions, from lofting of molten droplets by a meteor impact, or from accumulation of minerals coming out of solution inside a porous, water-soaked rock. Opportunitys observations that the spherules are not concentrated at particular layers in the outcrop weigh against a volcanic or impact origin, but do not completely rule out those origins. The images obtained to date are not adequate for a definitive answer. Scientists plan to maneuver Opportunity closer to the features for a better look. For information about NASA and the Mars mission on the Internet, visit: http://www.nasa.gov FROM LEFT, Gina Parrish (United Space Alliance environmental engineer), Doug Younger (NASA environmental specialist), S tephen "Bo" Brown (NASA explosives safety manager) and Steve Osmer (launch operations ordnance services lead) review various explosive ordnances used at the Spaceport. Page 8 SPACEPORT NEWS March 12, 2004 John F. Kennedy Space Center Managing editor. . . . . . . . . . . . . . . . . . . Bruce Buckingham Editor. . . . . . . . . . . . . . . . . . . . . . . . . Jeff Stuckey Copy editor . . . . . . . . . . . . . . . . . . . Corey Schubert Editorial support provided by InDyne, Inc. Writers Group. NASA at KSC is located on the Internet at http://www.ksc.nasa.gov USGPO: 733-133/600052Spaceport News Spaceport News is an official publication of the Kennedy Space Center and is published on alternate Fridays by External Relations and Business Development in the interest of KSC civil service and contractor employees. Contributions are welcome and should be submitted two weeks before publication to the Media Services Branch, IDI-011. E-mail submissions can be sent to Jeffery.Stuckey-1@ksc.nasa.govBUY YOUR TICKETS to the KSC All American Picnic 2004 starting March 15. Above (from left), Woodrow Whitlow, deputy center director; Joye Williamson, treasurer; Jim Kennedy, center director; Claudette Beggs, publicity chairperson; and Jim Hattaway, associate center director, receive the first tickets for this year's event. Below, last year's picnic was enjoyed by all. everyone.The annual KSC All American Picnic is Saturday, March 27 at KARS Park I from 10 a.m. to 4 p.m. This years festivities will include childrens carnival games, community demonstrations, the chili cookoff, bands, rock wall climbing, a car show, dunking booth and much more. Tickets go on sale March 15 at the Headquarters, O&C, SSPF and OSB sundry stores; in CCAFS Hangar I Annex Room 204; and at the KARS Country Store. Tickets will be sold March 25-26 at Headquarters, O&C, SSPF and OSB cafeterias. Check out the Web site, www.kscpicnic.ksc.nasa.gov, to find out where volunteers are needed for picnic activities. Because SeaFest 2004 in Port Canaveral is the same weekend as the KSC Picnic, the Cocoa Beach Area Chamber of Commerce and the Canaveral Port Authority will provide 3,000 entrance tickets at the picnic for the event. Look for their booth to pick up your ticket. The complimentary tickets are good for Saturday afternoon or evening and Sunday. For information about the picnic, send e-mail to Claudette.M.Beggs@nasa.gov.Tickets on sale Monday for the All American Picnic 2004The 41st annual Space Congress will provide a forum for space professionals to meet and share their knowledge of technical issues facing the space program. The event, scheduled for April 27-30 at the Radisson Resort at the Port in Cape Canaveral, includes technical paper and panel sessions, a youth science fair, receptions and an evening with astronauts. The theme is Determination: Meeting todays challenges, enabling tomorrows vision. The international conference brings together the scientific, commercial, military and educational communities to discuss current and future activities affecting space initiatives. Topics will provide broad insight into government and civilian space initiatives, and serve as the forum for professionals to discuss issues that affect the global space community.Annual Space Congress provides insight to future challenges Although Whitehead kids that her methods are unconventional, many space pioneers valued her contributions. [Dr. Kurt] Debus, [Wernher] Von Braun and Karl Sendler used to come running into my office and grab the film out of my hands, she said. When I was out there, it was all optical data. Telemetry was just getting started. I would tell them how fast a missile was rolling or turning.WHITEHEAD . .(Continued from Page 1)The agenda will address the return to human space flight, planetary exploration and the impact of the mission to Mars and possible new initiatives to the moon, Chinas foray into space, the X-Prize initiative, military space policy, spaceport range technologies and more. As chairman of the event this year, I am focused on developing an outstanding program for attendees bringing together a whos who of notable speakers from the science and space communities, said Dan LeBlanc, general chairman of Space Congress and chief operating officer of Delaware North Companies at the KSC Visitor Complex. Now more than ever, the space industry is facing a diverse range of opportunities and challenges. For information about Space Congress, visit the Web site at www.spacecongress.org or call (321) 452-3068.